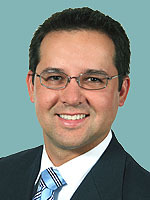 Dr. German Velasco is a graduate of Universidad El Bosque, Bogotá, Colombia. He continued his training at University of Miami School of Medicine and Harvard Medical School. He completed an Internal Medicine residency at Lenox Hill Hospital, New York, N.Y. and a fellowship in Endocrinology, Diabetes and Metabolic Diseases at Thomas Jefferson University, Philadelphia, Pa. He is a member of the American Association of Clinical Endocrinologists, the Endocrine Society, the American College of Physicians and the American Medical Association. Dr. Velasco provides specialty treatment for patients with conditions such as diabetes Type I and Type II, metabolic syndrome, thyroid and parathyroid disease, pituitary and adrenal disorders, hypogonadism and menstrual irregularities. He is fluent in both English and Spanish.